This is the first of a series of weekly SPERI Comments by SPERI staff and students on the theme of inequality that will run from now until the British General Election in May. In it Colin Hay reflects on the reasons for the perhaps surprising return of inequality to the public debate and the social, political and economic context in which that debate is taking shape. He warns that, although we may well be more aware today than ever of the extent of the social and economic inequality that scars our society, this does not mean that we have accepted a responsibility for dealing with it. Indeed, the economic and public policy regime that has been consolidated in Britain since the crisis is itself staggeringly inegalitarian in its effects – not so much ‘trickle-down’ as ‘upward-cascading’ economics. Inequality is back. Of course, there is nothing at all surprising about this. For not only did it never go away, but, as a vast and seemingly ever more influential literature shows clearly, it has in fact been accelerating in the Anglo-liberal world in an almost exponential way since the 1980s and throughout the ‘great moderation’. And there are reasons for thinking that this acceleration is only set to intensify in the years to come. But that is to get a little bit ahead of ourselves. The point for now is that inequality is back in a perhaps surprising way – in that it now dominates the public debate in a manner that it has not done in Britain since the early to mid 1940s. But we need to be careful not to assume that Thomas Piketty, Joseph Stiglitz and Danny Dorling are harbingers of change – the Beveridges and T. H. Marshalls of our (rather different) times. That would be both premature and, alas, far, far too optimistic. To see why, we need to consider the reasons for inequality’s perhaps surprising return to the public discourse and the politics to which it is currently giving rise. Let’s start with the good news. There are at least two elements to this. The first is that, particularly in the work of authors like Thomas Piketty and Danny Dorling, we now have rich, lucid and supremely well-evidenced accounts of the widening of social inequality since the early 1980s – and, in Andrew Sayer’s new and startlingly brilliant Why We Can’t Afford the Rich, as clear an exposition as it is possible to have of the economic pathologies of such distributional asymmetries. The case for change, in other words, is clear and compelling – and, above all, it is prominent in the public debate. Second, it is not just inequality that has returned to the public discourse – but capitalism too. Indeed, for the first time in a long time, we can and do talk about both inequality and capitalism in the same breath and as inherently interlinked (in, for instance, the argument eloquently expounded in the New York Times that previously unprecedented levels of societal inequality are a product of workers’ declining profit share). It is the contours of our current capitalism that are responsible – and, perhaps more surprisingly still, seen to be responsible – for the stark inequalities that characterise, as they scar, the societies in which we live. So far, so good. But why is it that inequality and capitalism have returned to capture the public zeitgeist today? The answer is disarmingly simple, obvious even. And it is here that the story becomes rather more predictably depressing. Inequality has been growing at an alarming rate for over three decades and the crisis both exacerbates and graphically illustrates the cumulative consequences of the social and economic processes responsible. Put slightly differently, in the context of the sustained growth of the ‘great moderation’ (the period from the early 1990s until the onset of the crisis), it was much easier to turn a blind eye to the seemingly inexorable advance of relative inequality and infinitely more credible than now to offer the (always trite) ‘trickle-down economics’ defence (invariably, that relative inequality was a necessary and acceptable price to pay for higher aggregate levels of growth). The crisis, in other words, has led us to look anew at the great moderation – and it is not surprising that there has been revealed, in the process of that retrospective re-evaluation, its darkly inegalitarian underbelly. Indeed, the crisis arguably marks the point at which widening relative inequality masked by (sustained, if undramatic) growth gave way to rising absolute inequality for the majority of citizens. The figures, even before the crisis, are awful. As Piketty demonstrates in graphic detail, the share of total income captured by the top percentile grew in Britain from a depressing 6% in 1980 to a staggering 15% in 2008; and, more significantly, over the same time period, its share of national wealth rose from just over 20% to just over 30%. Danny Dorling’s numbers are almost identical. But what Piketty and Dorling have thus far failed to show (in part because the data is not yet in) is what has happened since the crisis. This is where the story becomes more depressing still. If the inequality scenario before the crisis was horrendous, then it has only worsened subsequently. For what we now know definitively is that the response to the crisis in Anglo-liberal states like Britain has essentially been two-fold: public austerity, on the one hand, and an ever more concerted and frenetic attempt to re-secure the conditions of asset price (and hence wealth) appreciation, on the other. Arguably, this has served only to accelerate the transition to what is usually called ‘asset-based welfare’ (in which citizens take an increasing responsibility for meeting their future welfare needs by accumulating a portfolio of liquid assets) – though, for reasons we will come to presently, the term has in this context become increasingly anachronistic. The argument is not difficult to make. Austerity on the scale and to the time-frame now envisaged by all the major UK political parties, and particularly in the absence of stable growth and rising tax receipts, can only be achieved by drastic (indeed, unprecedented) cuts in public welfare spending. And it was, of course, precisely those public programmes which are now most at risk that were almost solely responsible for compensating the poor for the rising social inequality they had come to experience since the 1980s. In short, austerity is itself synonymous with regressive redistribution – it is, and can only be, an inequality multiplier. Yet that is only half the story. For, having bailed out the banking sector with public funds (nationalising, in effect, its losses whilst demanding essentially nothing in return – not even a certain tolerance for a more precautionary regulatory environment), the Coalition Government has now turned its focus on re-securing the conditions of asset-price (notably house-price) inflation – and, to date at least, with some success. The consequence is that those with accumulated assets (with wealth, in other words) are the key beneficiaries of the post-crisis public policy regime that is now in place – and they are set to benefit in proportion to the assets that they already hold or have the resources to acquire. That is staggeringly inegalitarian, and not just for British citizens. Russian oligarchs with (depreciating) roubles to burn can currently secure a 30% per annum return on their investment (in sterling – more, of course, in roubles) by ‘speculating’ or ‘taking a position’ in the London housing market (and, of course, they can do so without having to pay capital gains tax when they seek to liquidate their assets and repatriate their profits). This is not asset-based welfare, nor is it trickle-down economics – for the trickle has turned into a torrent and the torrent is raging upstream. Whatever we call it, it is contributing – very significantly – to the house price inflation radiating out of the south-east of England and hence to asset- and wealth-based inequality in Britain. And it is but one example. The picture I have painted is already profoundly and, indeed, unapologetically bleak – if we are to do something about these dynamics then we need to face up to how bad they really are. Yet it only gets worse if one brings inter-generational factors into the equation. For all generations are not created equal in the kind of analysis I have been developing. To paraphrase Orwell, some generations are more equal than others – and the most equal of all, almost certainly, will turn out to be the ‘baby-boomers’ (those born between 1946 and 1964). For the rest of us, things are only going to get worse … and, for some of us – the very young especially – much, much worse. This is not just because the employment prospects and debt levels of students leaving higher education today and in the future mean that the housing market is seriously over-valued, nor that interest rates are currently at an historic low and will at some time start to return to more normal levels precipitating (indeed, exacerbating) a crisis of affordability in the housing market – and thereby cutting off asset-appreciation as a means to meeting future welfare needs. No, in inter-generational terms, it’s far worse than that. The reason is that there is one massive and all-too-familiar omission in the preceding analysis – the environmental crisis. This, too, is likely to prove starkly inegalitarian both inter-generationally and in terms of its differential impact on citizens’ quality of life and, indeed, life-expectancy. To get a sense of both, simply reflect on the differential consequences in terms of life-expectancy we might expect to follow from anticipated climate change in the years ahead. This is perhaps best presented graphically (see Figure 1) – not least because it is so profoundly disturbing to put into words. 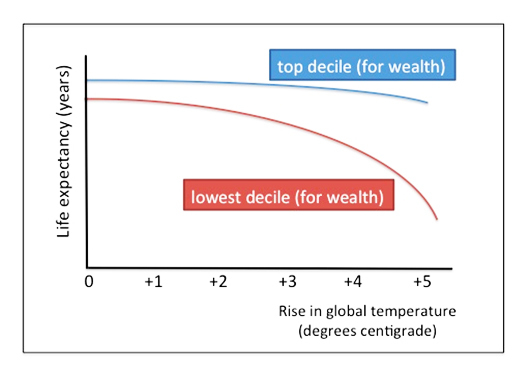 It need hardly be pointed out that the x-axis (degree of global warming) can, in the absence of concerted and globally-coordinated efforts to reverse climate change, simply be replaced by ‘time’ (with the origin of the graph representing conditions today). So where does all of this leave us? The short answer is in a sorry mess. Inequality is rife and has been for a very long time. It has made considerably worse by the crisis, which has shown quite how bad things have gotten – and quite how mistaken we were to believe that markets, left to their own devices, would deliver sufficient growth to trickle down even to the poorest in our societies. Yet we do not appear to have learned the lessons of any of this. For our response to the crisis has been to put in place an economic and public policy regime which serves only to exacerbate existing inequalities of income and, far more significantly, of wealth. This might provide the very richest in our societies with the resources they will need to mitigate for themselves alone the worse effects of the environmental crisis that looms increasingly large. But, even for them, that may provide little solace. In the alarmingly prophetic words of Dani Rodrik, written in 1997 in Has Globalization Gone Too Far?, ‘social disintegration is not a spectator sport — those on the sidelines also get splashed with the mud from the field. Ultimately, the deepening of social fissures can [and does] harm all’. What’s more, it need hardly be pointed out that, in the absence of the willingness or capacity of the parties of the centre-left to speak to the theme of inequality, that deepening of social fissures provides rich dark soil for the politics of what, until so recently, we called the ‘extreme’ right and which now tends simply to be referred to as the right.